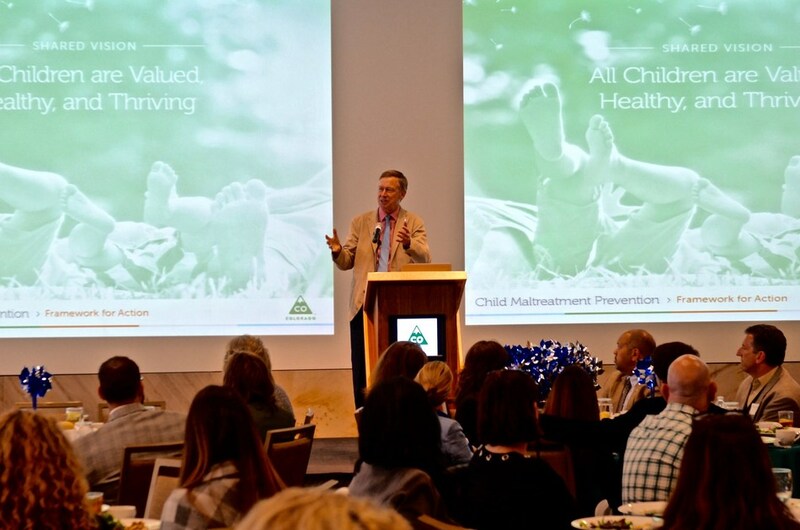 At an event in Denver this afternoon, Governor Hickenlooper and the Colorado Department of Human Services (CDHS) unveiled the Colorado Child Maltreatment Prevention Framework for Action – the state’s first and most comprehensive child maltreatment plan in more than two decades. The governor also announced that 10 communities will be selected through an application process to receive financial support and technical assistance to create the first local child maltreatment prevention plans using the framework. Nearly 200 partners in the prevention of child abuse attended the launch event hosted by CDHS at History Colorado. The purpose of the framework is to help local communities and state agencies create a more focused and measurably integrated approach to preventing child maltreatment and promoting child well-being. The Framework will guide community planning and future investment of resources to mobilize action that protects children, and will include monitoring systems to track implementation and measurable progress. The development and launch of this framework was funded by the Office of Child Abuse and Neglect in the Children’s Bureau, an Office of the U.S. Administration for Children and Families, and the Zoma Foundation, a new Ben and Lucy Ana Walton family charitable organization with a focus on funding initiatives that have a positive impact on early childhood development. The Zoma Foundation has committed approximately $500,000 to the initiative and is helping turn the framework into action at the state and local community level. In addition to guiding the investment, programs and policy under CDHS’s purview, the Colorado Department of Public Health and Environment (CDPHE) has also adopted the Child Maltreatment Prevention Framework for Action as a guide to inform prevention efforts. For example, Colorado’s 48 Child Fatality Prevention System local child fatality teams, supported by CDPHE, will use the framework as a guide to inform prevention efforts in their communities. The federal Community-Based Child Abuse Prevention Funds for Colorado will also use the framework to develop new giving guidelines. Other event speakers included Deborah Daro, Ph.D., associate professor and research fellow at the Chapin Hall Center for Children at the University of Chicago, and Mary Anne Snyder, director of the Office of Early Childhood at the Colorado Department of Human Services. The launch of the statewide plan is the first step of this new initiative in Colorado, and will be followed by a community planning process wherein 10 Colorado communities (to be announced at a later date) will be selected to receive funding and support from the Zoma Foundation and the CDHS Office of Early Childhood. The funding and support will allow local communities to engage with the framework and tailor a local plan for prevention of child abuse and neglect. At the local level, communities can identify their unique priority areas of improvement, create corresponding action plans for each priority area, and deploy monitoring systems to track the implementation of changes and resulting progress. The process for communities to apply for a grant to deploy the framework locally – including planning, implementing and measuring outcome indicators – will be accessible by visiting the Colorado Vendor Self Service (ColoradoVSS) website. To learn more about the Colorado Child Maltreatment Prevention Framework for Action and download a toolkit for building a community that supports families, visit the Colorado Child Abuse and Neglect Public Awareness Campaign website at http://www.co4kids.org/.